The third annual Women’s March took place on Saturday, Jan. 19. This march continues to impact women around the United States significantly. The marches and rallies are designed to engage and empower all people to support women’s rights, human rights, and social and environmental justice. “When the opportunity to march came along, I felt I was destined to do so,” said rally speaker Mona Shaikh. The Women’s March of California is committed to represent the vision of humanity and equity for all. Supporters of this march commonly do not tolerate hate speech, bigotry, white supremacy, racism, misogyny, anti-semitism, homophobia, transphobia, or any other form of hatred. People who march join to petition for human rights, dignity, and justice. The march emphasizes that women’s rights are human rights and human rights are women’s rights. Americans must create a society in which women, including black, native, poor, immigrant, disabled, Muslim, Jewish, and LGBTQ, have freedom and equality in a safe and healthy environment free from sexism. While marching, it is clear that all who participate are trying to celebrate women in government and emphasize how women should be empowered. The most impactful part of the march was seeing strength in numbers. 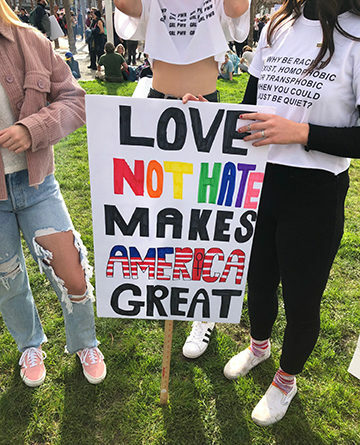 There were many creative signs with inspiring messages and speeches that illuminated bravery and empowering chants that were heard in the San Francisco streets for miles and miles. One speech was especially moving. The speaker was a homeless single mother marching/fighting for health care and education opportunities for her four young children. Her words brought people together and her story moved many. This march is a stepping stone to keep putting women in power. The goal of this particular march is to raise awareness on women’s issues. It is amazing that there are many who support women and their worth. This is milestone that is making history and opens up a great opportunity to become politically active. Although this is a time when many support feminism and the empowerment of women, it cannot stop after the rally is over. We must continue to support women actively and consistently. It is not enough to just march, you must take action after to improve the future.